We've seen the story before -- small-town girl moves to the big city to make it in the biz. 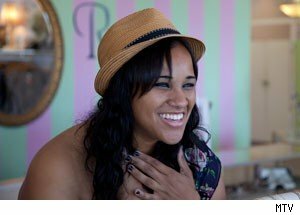 But Chelsea Settles, the star of MTV's latest docu-series, is slightly different than your normal heroine. Unlike most college grads trying to forge a career in the fashion industry, Chelsea weighs 324 pounds. The six-episode reality series 'Chelsea Settles' (premieres Tue., Oct. 11, 11PM ET on MTV) follows the 23-year-old as she moves from a tiny city outside of Pittsburgh called Uniontown, Penn. to Los Angeles. "It's like 'Cheers,'" Settles told AOL TV of her hometown. "Everyone knows everyone. They know your family history. It's definitely very stifling at times, but after being away for so long I definitely do appreciate home and where I come from." After studying fashion merchandising and marketing at the Art Institute of Pittsburgh, Settles wasn't quite sure what to do with her degree. She responded to an MTV casting call and much to her delight, the network chose to follow her as she not only moved to LA but embraced a completely different, healthier lifestyle. Settles called AOL TV from her Pennsylvania hometown -- she moved back in with her family for a bit while the show airs -- to talk about the terrifying prospect of broadcasting your weight to the country, turning into Kim Kardashian and whether she'd do another season. I think I was just at the end of my rope. I was tired of being a victim of my surroundings and just being in a toxic environment and watching my mom be so sick all the time. I had to find the courage and something within myself that I honestly didn't know existed to just get up and go. I knew that I had to make a change, as scary as it was to put myself out there. The opening scene of the first episode shows you ordering fast food, eating it in your car and hiding the wrappers. That's really, really personal. How did you get the courage to show that onscreen? I had to pretend the cameras weren't there. It was really hard for me to expose myself like that, but because this is such a personal journey, it was kind of easy to tune everything out and just be in the moment and be in my own head. I kind of embraced being a guinea pig because I know that there are other girls out there that are like me, so if I have to just stop being afraid and put myself out there in order to have someone else's story told and give them the courage to make a change, then it's well worth it. So I just put it all out there. It's something honest; that's the best part of the show. My weight is something that I have struggled with for as long as I can remember. It's something that I believe has stopped me from doing every and anything. It made me not want to be social, go to parties. I thought that everyone I met would judge me, and I would pin all of that back on my weight. "As soon as I lose the weight I'll go to clubs and I'll make friends and I'll be a better girlfriend in my relationship." But until then it was just, "No, I can't move because of my weight. I cant do this because of that." I was just exhausted, mentally and physically exhausted, and I knew I had to make a change. What was the first difference between what you expected LA to be and what it was actually like? I thought that as soon as I stepped off the plane there would be a red carpet that was rolled out, the sidewalks would be beaming with glitter, there would be celebrities everywhere, people just prancing around in ball gowns. But I got there and it was like "OK, well this looks like a normal city. I mean, it was beautiful -- there were palm trees -- but it wasn't like what I'd seen on TV watching 'The OC' or 'The Hills' or things I've studied. When you got there, did you start doing those things you wanted to do? I guess those fears don't really go away just because you're in a new place. Did you notice people treating you differently? I think in my head I thought everyone treated me differently anyway. Whether I was at school, at home, in LA, I thought that as soon as I started walking down the sidewalk people automatically noted, "What's the fat girl doing here?" That's always been my mentality. I noticed from the episodes I've watched that you have a really positive attitude about everything. Even when you're crying you're kind of smiling. Are you really like that all the time? I am! It's so strange. [Laughs] I know that there is always another day. Despite what's going on, someone has it a lot harder than I do. So even though I go through struggles, I don't want to be negative. I really am a happy person. [Laughs] Regardless of everything else, I know that I'm really blessed, so what's the point in complaining? Do you think you complete a journey throughout the six episodes of the show or is it still a work in progress? I think that I have gone through a lot. I'm definitely still a work in progress because we all are! I think regardless of what happens in my life I'm going to find something that I can do better. What's one thing you want people to know about you before they watch the show? If you had a chance to say something to people who criticize you or judge you, what would you want to say to them? I'd want to say thank you, because they've helped me be the person I am today. I'm going to keep smiling; I'm going to keep being positive. They've helped me grow a tougher skin. They've fueled the motivation to get to the finish line. I don't know how long that's going to take, but I keep those things in the back of my mind when I have to keep going. Would you do another season? For sure. Absolutely. It was something that was really really challenging, but everything is worth it in the end. I would do it a million times over, as hard as it was. 'Chelsea Settles' premieres Tue., Oct. 11 at 11PM ET on MTV.